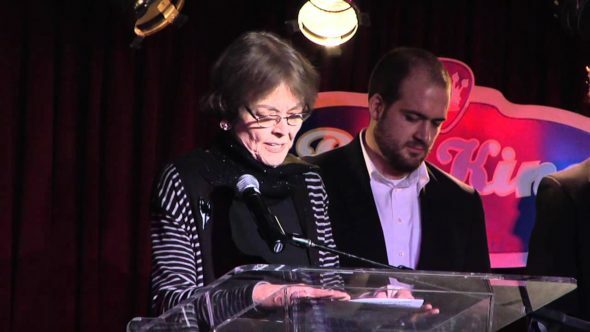 Beloved and acclaimed soap opera writer, Claire Labine, passed away last week, at the age of 82. Labine got her start in another genre of daytime TV, writing for the children’s program, Captain Kangaroo from 1966 to 1968. The nine-time Emmy winner went on to create Ryan’s Hope with Paul Avila Mayer. The soap ran for 13 years on ABC. The network eventually cancelled it, in January of 1989. Labine and Mayer first worked together in 1973 on the daytime drama, Where the Heart Is. CBS cancelled it after four years, in 1973. The network then named her co-head writer on Love of Life, which ran from 1951 to 1980. In 1993, Labine took the reins of ABC’s General Hospital. She gave fans the Sonny (Maurice Benard) and Brenda (Vanessa Marcil) super-couple, as well as many touching storylines still cherished by fans. During her tenure at GH, Labine introduced the African-American Ward family. She created the Stone Cates (Michael Sutton) character and oversaw the ground-breaking romance of Stone and Robin Scorpio (Kimberly McCullough). The Stone character contracted HIV and transmitted the virus to Robin. While Stone died a heart-breaking death, Robin’s HIV was diagnosed quickly and was well controlled with medication. The character continued on to become a doctor, wife, and mother with a full and active life. While McCullough, who originated Robin as a young child, left GH to develop her career as a director, she does return to the role of Robin when time and storyline permit. If the memory of Stone’s death doesn’t have you in tears, let us remind you that it was under Labine that Barbara Jean “BJ” Jones (Brighton Hertford) died. Her step-mother Bobbie Spencer (Jacklyn Zeman) and father Tony Jones (Brad Maule) then donated BJ’s heart to cousin Maxie Jones (then played by Robyn Richards). Labine also created other GH characters including Kevin Collins (John Lindstrom), Carly Benson Corinthos (first played by Sarah Brown), Serena Baldwin, Katherine Bell (Mary Beth Evans), Jasper “Jax” Jacks (Ingo Rademacher), Mike Corbin (Ron Hale), Lily Rivera (Lilly Melgar), and Lois Cerullo (Rena Sofer). Labine left GH to create a spin-off soap for ABC with her son, Matthew Labine. Known as both Heart and Soul and Union Place, the series was to feature two Brooklyn families, one white and one black. Ultimately, the network passed on the daytime drama. The Labines tried to shop it elsewhere, to no avail. ABC went with Wendy Riche’s Port Charles, instead. Still under contract at ABC, Labine went on to become head writer at ABC’s One Life to Live in 1996 and remained with the show until 1998. Her last television job was as head writer on Guiding Light, from August 2000 to July 2001. Her son Matthew and daughter Eleanor Labine boarded the series with her. Per Deadline, no cause of death has been released. May she rest in peace. Watch Ms. Labine accept the Ian McLellan Hunter Award for Lifetime Achievement in Writing. Finally, if you are a big Claire Labine fan, do not miss this in-depth interview of her, at WeLoveSoaps.net. We invite you to share your memories of Ms. Labine and her work, below.